Smartphone manufacturers are struggling to get people to upgrade because new models lack earth-shaking features. But these new devices will still offer significant improvements, including powerful processors, better screens and enhanced cameras, as seen at CES. Lets look at what some specific makers are doing. LG isn't giving up on the idea of curved smartphones with the launch of the G Flex2, which is curved from the top to the bottom. Interestingly, LG has decreased the screen size from 6 inches to 5.5-inches, while at the same time increasing the resolution to 1080p. I am still not a fan of the Flex2's curve, which is intended to make the smartphone more ergonomic and comfortable to use. However, Samsung's Galaxy Note Edge, with its curved side, is more useful: it lets users access and see more information and features alongside the main screen. In fact, LG's display team showed a side-rounded screen as well, so this is a concept that seems to be catching on. The key is to come up with applications that make good use of the rounded edge, so that whatever is displayed there is helpful and not distracting. Even though it wasn't a trend at CES, more high-end smartphones will get screens with a 2560 by 1440 pixel resolution (also known as QHD), like the ones already available with Google's Nexus 6 and LG's G3. High-resolution screens are also trickling down to cheaper smartphones. The basic model of the LTE-equipped ZenFone 2 costs US$199, but packs a 5.5-inch screen with a 1080p screen, which is impressive. It also has a 13-megapixel camera on the back and a 5-megapixel camera on the front. In general, buyers of phones that cost under $200 without a contract will get more bang for their buck this year with better screens, cameras and LTE support. The insides of the Flex2 and the ZenFone 2 are also harbingers of what's to come this year. 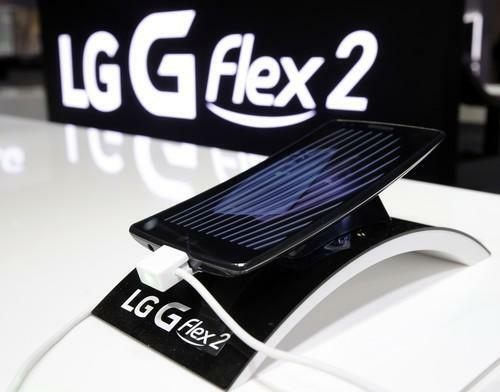 The Flex2 is powered by the 64-bit octa-core Snapdragon 810 processor, which is Qualcomm's new flagship processor. The processor will likely power many other high-end smartphones. It offers performance improvements across the board, including the ability to use faster memory and speedier LTE connections along with extensive support for 4K video with the help of the Adreno 430 GPU. Meanwhile, the ZenFone 2 can have up to 4GB of RAM, which should help improve multitasking performance. Vendors have been slow to increase the amount RAM in their devices, but the ZenFone 2 may signal a change in this respect. Asus is still very much a challenger in the smartphone market, and it needs something special to help it grab the interest of consumers. While it's doing that with hardware, fellow challenger Alcatel OneTouch is doing the same with software. The company's new PIXI 3 family of smartphones is operating system-agnostic, and runs Android, Firefox OS or Windows Phone. The OS choice is made when buying the smartphone, as is the case with the HTC One M8, which comes with either Android or Windows Phone. So what does all this mean for smartphone buyers? If I had bought a new high-end smartphone last year, I'd skip upgrading this year. But for people that have older products or are in the market for a cheaper smartphone, this year's crop of products will look enticing.